It is a complete package to recover missing user data and save it to file. It can be used by administrators, professional and regular businessman to migrate Exchange emails to MSG. It can even extract and save complete mailbox data to multiple .msg files. This tool provides a convenient way to export data from a user account stored in an orphan .edb file. 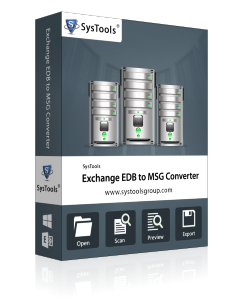 It takes an EDB file as input and converts each item of EDB file to MSG format. This includes emails, contacts, calendar, notes, journal etc. There is no need to have Exchange server environment to use this application. The program is built to remove any errors and bugs from either priv.edb and pub.edb database. It performs a quick scan by default to repair any minor corruption or damage issues. There is an option to recover user data from high-level of corruption by opting for ‘Advanced Scanning’ mode. 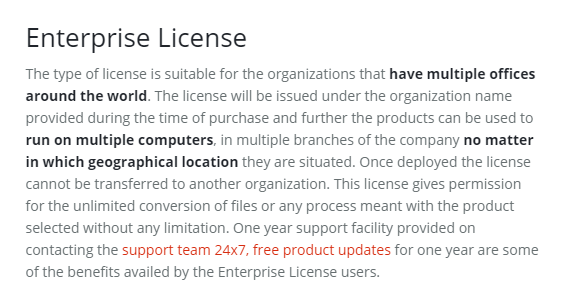 This facility is available while importing EDB file into the tool. The application is specifically designed to scan and load all mailboxes stored in the Exchange database. It allows users to view each user account will items stored in its folders before EDB to MSG migration. It provides a clearer understanding of the time it will take to move user data. 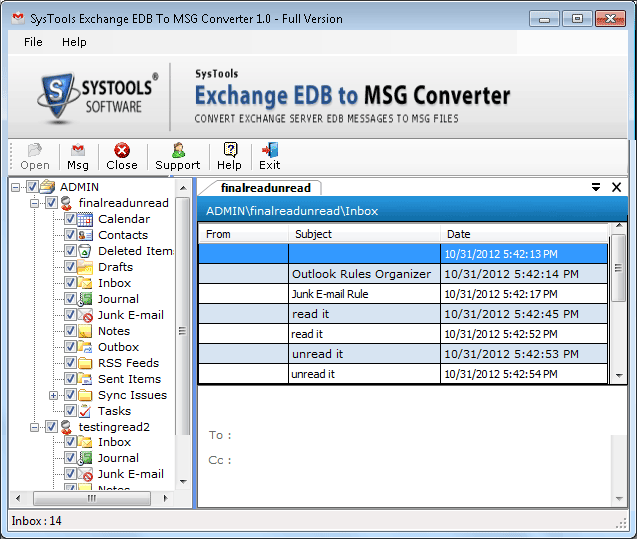 The EDB to MSG Converter allows a preview of each contact, email, calendar, notes etc. items stored within. One can choose between these to take to the output format. A corresponding folder of each will be created in the destination path with .msg files. There is a checkbox displayed before each item to make the selection. There is a transfer log created for each element being moved to MSG format. It shows an honest progress of the EDB to MSG conversion in three tabs: ‘Pending’, ‘In Progress’ and ‘Completed’. These reports keep changing dynamically during the migration. It provides a complete picture with reliable and relevant results. 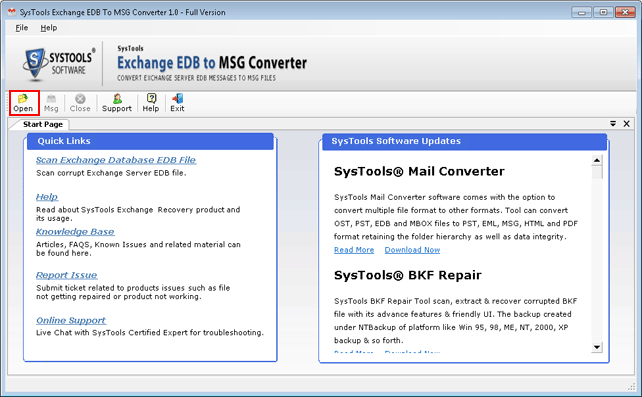 Demo version of EDB to MSG Converter scan & preview of all items of Exchange mailboxes. 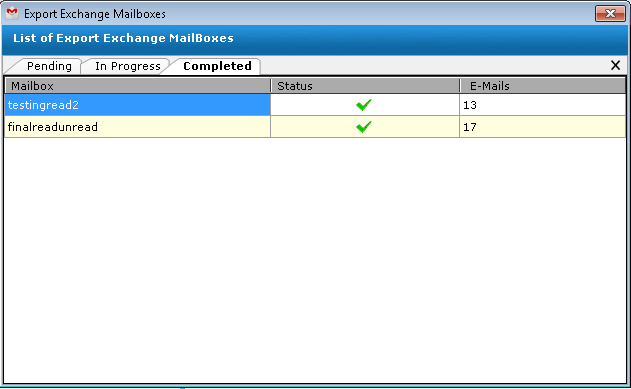 Is Outlook installation needed to convert EDB to MSG? No, the Microsoft desktop email client installation is not essential for the migration. What versions of Windows are supported by the tool? The software is compatible with all the latest Windows 10 and earlier versions for both 32 and 64-bit machines. Can I export contact folders from multiple mailboxes in one go to MSG format? Yes, one can select different folders by checking a box before each from the EDB file preview. Then, move each item of EDB to MSG format. This is a remarkable product. I had no idea it gave such efficient results. My team recommended buying it after there was some issue in one of our mailboxes. I must say it was a great value for money. It removed corruption from the entire Exchange database and helped us recover important email conversation as MSG files. My colleagues and I were discussing saving some important messages to file for backup purposes. This is when we used the EDB to MSG Converter. It easily transferred multiple email folders in one go. It has no complicated features that would be difficult to understand. All was done in a matter of minutes with just a click of a few buttons. Great!